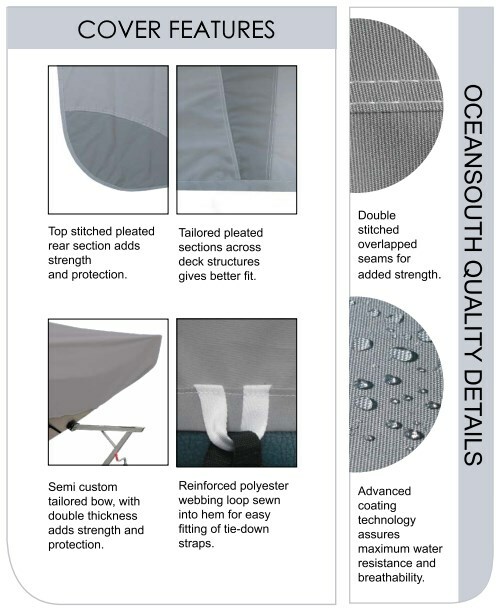 A semi-custom quality boat cover by Oceansouth, suitable for inflatable tenders and ribs from 2.3m to 4.7m in length. These Oceansouth boat covers are tailored to fit across the boat smoothly to the stern. They fit boats with outboard motors fitted. Manufactured from Cyclone™ woven polyester fabric 300g/m2 – 9 oz/yd2, these covers are also suitable for highway towing. Please choose carefully. Refer to the Measuring Instructions to select the right cover for your boat. The cover is exactly as I expected, made of seemingly good fabric and fit my RIB perfectly. I don't know how long it will last but it looks good now. Boat cover took only 4 Days to be Delivered From Sydney to WA and I was Very happy with the Quality and size especially as it was half the price of a Quicksilver one. Delivery very ordinary from Sydney to WA via Fastway Couriers. Very happy with our new cover for our inflatable. It fits our boat perfectly and is made of quality fabric. After ordering a cover and then realising I had ordered the wrong size the guys at The Boat Warehouse were so very helpful and fixed the problem making sure that I received the correct one. It arrived really quickly within days of ordering. The cover was a much better quality than I was expecting particularly at the price, it fits very well. Click the button below to add the Boat Cover - Inflatable Tender to your wish list.